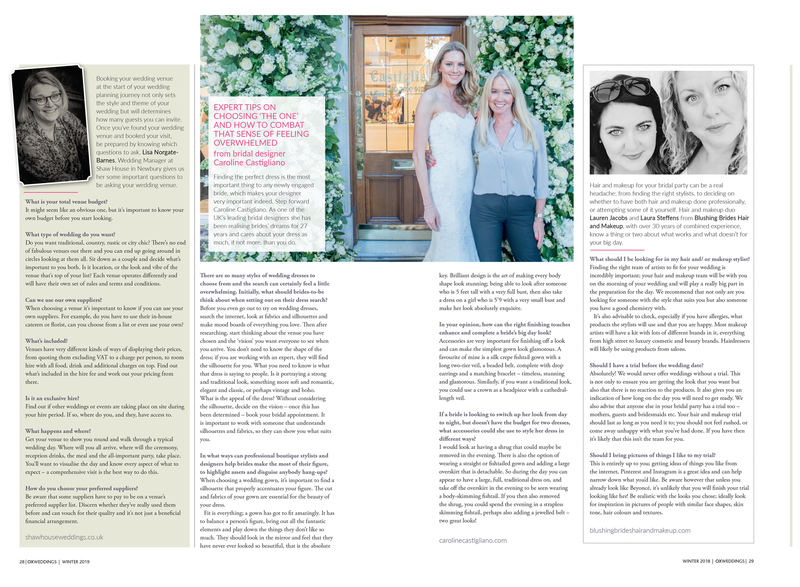 Caroline Castigliano shares her tips on finding the perfect wedding dress in Ox Weddings Magazine. Read the full interview below. There are so many styles of wedding dresses to choose from and the search can certainly feel a little overwhelming. Initially, what should brides-to-be think about when setting out on their dress search? Before you even go out to try on wedding dresses, search the internet, look at fabrics and silhouettes and make mood boards of everything you love. Then after researching, start thinking about the venue you have chosen and the ‘vision’ you want everyone to see when you arrive. You don’t need to know the shape of the dress; if you are working with an expert, they will find the silhouette for you. What you need to know is what that dress is saying to people. Is it portraying a strong and traditional look, something more soft and romantic, elegant and classic, or perhaps vintage and boho. What is the appeal of the dress? Without considering the silhouette, decide on the vision – once this has been determined – book your bridal appointment. It is important to work with someone that understands silhouettes and fabrics, so they can show you what suits you. 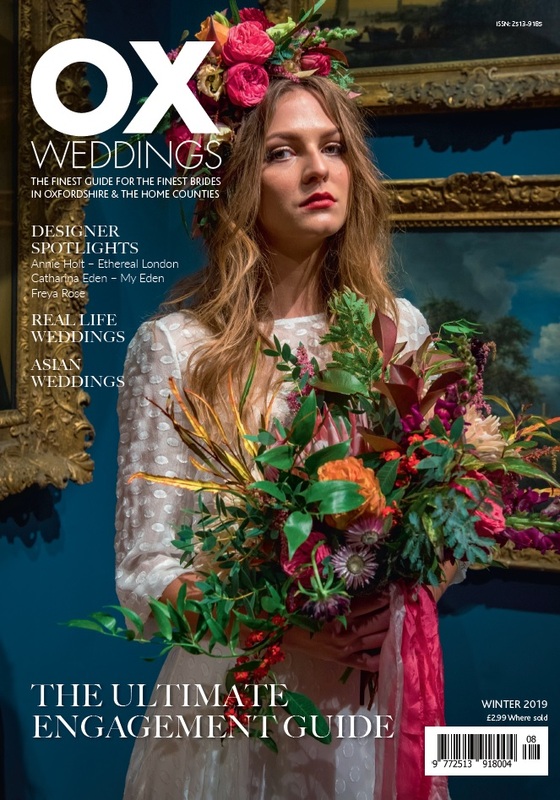 In what ways can professional boutique stylists and designers help brides make the most of their figure, to highlight assets and disguise anybody hang-ups? key. Brilliant design is the art of making every body shape look stunning; being able to look after someone who is 5 feet tall with a very full bust, then also take a dress on a girl who is 5’9 with a very small bust and make her look absolutely exquisite. In your opinion, how can the right finishing touches enhance and complete a bride’s big day look? Accessories are very important for finishing off a look and can make the simplest gown look glamorous. A favourite of mine is a silk crepe fishtail gown with a long two-tier veil, a beaded belt, complete with drop earrings and a matching bracelet – timeless, stunning and glamorous. Similarly, if you want a traditional look, you could use a crown as a headpiece with a cathedral-length veil. If a bride is looking to switch up her look from day to night, but doesn’t have the budget for two dresses, what accessories could she use to style her dress in different ways? I would look at having a shrug that could maybe be removed in the evening. There is also the option of wearing a straight or fishtailed gown and adding a large overskirt that is detachable. So during the day you can appear to have a large, full, traditional dress on, and take off the overskirt in the evening to be seen wearing a body-skimming fishtail. If you then also removed the shrug, you could spend the evening in a strapless skimming fishtail, perhaps also adding a jewelled belt – two great looks!